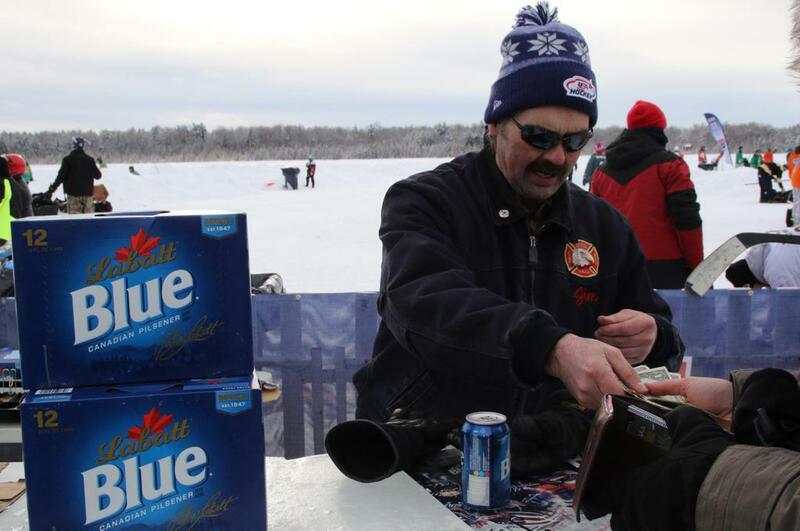 Tucked away in the back corner of the Labatt Blue Zone on Dollar Lake, the Eagle River Fire Department sells the coldest beer in town. The staging area is a 15-foot long ice bar made out of four giant ice slabs stacked on top of a pile of snow. It’s the handiwork of Jim Kauzlaric, a member of the Eagle River Fire Department, who built the top of the bar in his garage and carted it down to Dollar Lake for the weekend. 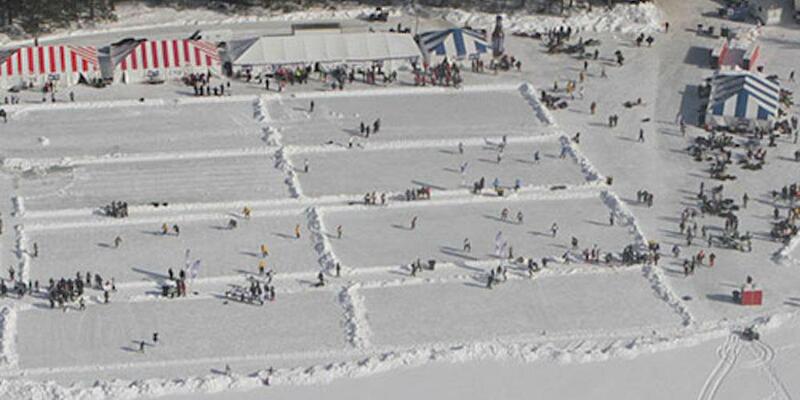 It’s just one of several efforts by the Eagle River Fire Department during the pond hockey event. They also cook and serve all the food at the concessions stand and work closely with USA Hockey’s ice crew to build and service the 24 rinks carved out of the snow that covers the lake. Jim Kauzlaric serves up some Labatt Blue to players on Day 2 at Dollar Lake. Natalie Spiess is on a mission. As the events coordinator for the Eagle River Chamber of Commerce and a member of its recreation association, the long-time resident is leading the charge to save one of the town’s most iconic and important buildings. 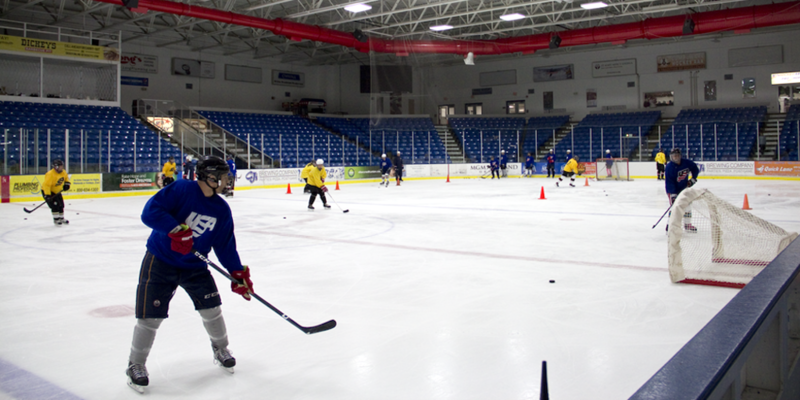 The Eagle River Dome ice arena has been home to generations of local hockey players, including former NHLer Craig Ludwig and Jinelle Zaugg-Siergiej, a member of the 2010 U.S. Women’s Olympic Team. But the 85-year-old structure is showing its age and is in desperate need of a new ice plant, which will cost the town $1.5 million to replace. In addition, the wood ceiling also needs to be repaired, and time is running out to raise the funds to get it all done before the start of next hockey season. According to Spiess, the arduous task of ripping out the concrete floor and replacing the system that makes the ice needs to be completed this summer. With time running out, she is spearheading a campaign to raise money and awareness, and is using the 2019 Labatt Blue USA Hockey Pond Hockey Championships to help get the word out. So Spiess has been making the rounds on Dollar Lake this weekend talking to pond hockey players about the Save The Dome project and to sell raffle tickets to a 50-50 drawing to help fund their efforts. A GoFundMe page has been created to help with the efforts. In addition, her group sold t-shirts at Saturday night’s game between the Eagle River Falcons and Marquette Mutineers to further the cause. 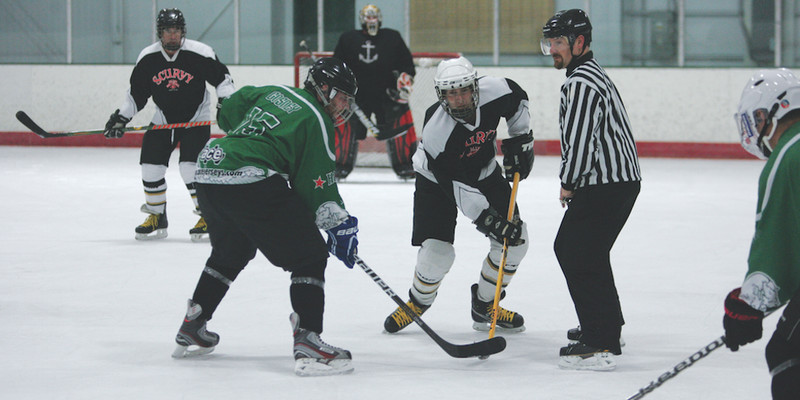 The game is part of the Great Lakes Hockey League that traditionally draws sold out crowds of pond hockey players who pack the rafters for a night of full-contact men’s hockey. A little known fact about the town and the rink is that Jimmy Hoffa, the infamous union leader whose mysterious disappearance in 1975 has fueled countless rumors regarding his final resting place, was a frequent visitor of Eagle River and had ties to the community. Spiess said there has been talk that he may in fact be buried under the concrete slab inside the rink. So when work begins on the replacing the floor, construction crews may be in for quite a surprise. Pat Weber retired from the Eagle River Fire Department last June. But he’s as busy as he’s ever been. The only change for the long-time fire chief is that now he gets to do things at his own pace. Weber has been involved with the Labatt Blue USA Hockey Pond Hockey Championships since the beginning, and the long hours he’s put into the making sure everyone has a great time in his hometown are very appreciated. In 2015, Weber was awarded the Adult Member of the Year at USA Hockey’s Annual Congress in Colorado Springs. Looking around Dollar Lake on Saturday, Weber can’t believe how much the tournament has grown since it first started in 2006. He can still remember receiving a call from long-time Eagle River resident and USA Hockey board member Don Kohlman, who said the organization’s adult council was looking for a place to stage an outdoor event. Weber told him that he knew just the place. Pat Weber clearing snow before players hit the ice at Dollar Lake.